Make it pop in purple! 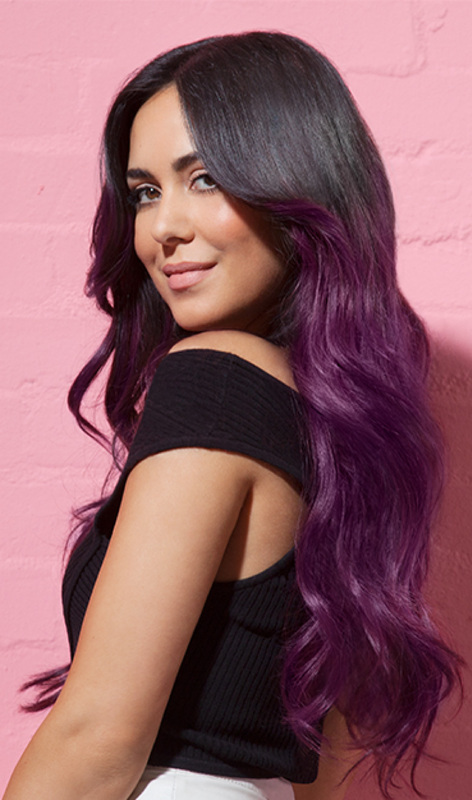 Choose the most vibrant of purples, or opt for your own custom pastel shade by mixing with the in-pack conditioner! Response from Schwarzkopf LIVE: Loving the custom purple Tara, thanks so much for the great review! I couldn't decide what colour to go next, so got my husband to choose for me, he chose right! The colour is beautiful, my hair was dry from bleaching and now feels and looks so much better. When it comes to dying my hair I love doing it but I hate the idea of having to mix 1 bottle up then apply that and then try and mix the next bottle without creating an art gallery in my bathroom. This dye is pre mixed which saves time, is brilliant if your new to hair colour and avoids the mess in the bathroom. I can't wait to try more of the colours in this range. If your thinking about dying your hair for the first time this range is the one to go for. Response from Schwarzkopf LIVE: Thank you very much! :D The Electric Blue is here to stay, don't panic! Brought this product as it states "2 in 1 bright or pastel" i have level 10 toned white hair was aiming for a light purple . After following all instructions and using the conditioner provided it came out faded pink and patchy all over and looked a mess , giving the product a second chance i tried again with more product and less conditioner this time it was more purple pink but still patchy. So for the final attempt i used the pure product with no conditioner and my hair came out a purple but still patchy. Over all i am very un satasfied with this product I have never had a problem with the other colours they have to offer but i believe this formulae needs re-working as it does not work. Response from Schwarzkopf LIVE: Hi Alison, thank you for taking the time to review! For best results with Purple Punk, use on Bleached/Pale blonde hair :) Hope this helps! I used purple punk and electric blue for a 2 tone colour and absolutely LOVE it!! Can't wait to do it again with the purple punk and mermaid green!!! I used 2 boxes as I have thick hair; when it came time to wash the excess dye off, it turned to a red/pink look. It does look nice but it is not what I purchased. Response from Schwarzkopf LIVE: Hello Abigail, thank you for leaving your review :) The amount of warm tones present after rinsing is normally attributed to being applied to a warmer base- for best results use on pale blonde bleached hair :) Hope this helps! Applied the purple punk in vibrant colour to underneath of hair as a peekaboo effect, it is a lovely colour, easy to apply and although it fades slightly with each wash it remains a lovely colour even as faded. Always had 'normal colours' till today... fancied a change and went with this! Absolutely love it. my hair is mouse brown naturally but highlighted to a lightish blonde. Roots had grown to about top of ear and the all over coverage is fab and taken well!..... want to try the whole range now!!! Response from Schwarzkopf LIVE: Hi Tasha, we're sorry to hear that. As with most colourants, colour results can be affected by your hair type and hair history, especially if you are applying to previously coloured hair. We would really like to find out a little more about your hair type/history to help you get the shade you’re after, so please get in touch with our Schwarzkopf Advisory Service on Freephone 0800 328 9214. Our expert colour advisors will be happy to offer you a free colour consultation over the phone. Thanks and speak soon. This was a great colour which I had on the underneath of my hair. Super vibrant! However, it says it lasts 12-15 washes yet mine has ALL washed out after just 3 with most of the colour being gone after 2. DO NOT USE IF YOU WANT IT TO LAST AS IT DOES NOT LAST AS EVEN CLOSE TO AS LONG AS IT SAYS. Response from Schwarzkopf LIVE: Hey Meg, we're sorry to hear of your quick colour fade. This is normally attributed to an increase in your hairs porosity- so make sure you're using moisture rich products to help combat this. Hope this helps! I usually use Pure Purple but wanted to try a different look. I have naturally dark hair so bleached my hair right back and used Purple Punk mixed with conditioner (my hair is thick so I needed more that two sachets but luckily had some at home that I hadn't used from other applications). The colour looked very strong and vibrant when I mixed it so I was a bit worried, but the final results were amazing! I highly recommend it and would give it a go again (I think I will mix some blue in next time). I've been using Live products for over a decade and always get positive comments, even from strangers! Thank you very much for creating such great colours and interesting application methods! I love my new LIVE look! I have sections of pre-lighted and natural dark-blonde hair. I used 90% 094 Purple Punk Mixed in with 10% 095 Electric Blue and a good deal of moisturiser to create a slightly less vibrant result. The varying shades of my pre-coloured hair give an amazing toned effect throughout and I think the overall result suits my skin tone perfectly. Simple, great value for money and I could not be happier. Response from Schwarzkopf LIVE: So great to hear, Jenny! Thanks for sharing. Response from Schwarzkopf LIVE: Great to hear! Thanks, Shelley. Love it!! Brilliant colour doesn't fade quickly and easy to apply. It runs Everytime you wash (which is expected) also if you put vaselene around the skin on your hair line it won't stain your skin. I found I had to leave it on for over a hour to get desired colour. Response from Schwarzkopf LIVE: Thanks for the review, , Sophie! Response from Schwarzkopf LIVE: Greta to hear, thanks Shelley! Response from Schwarzkopf LIVE: Thanks for taking the time to review Sarah. If you're regularly bleaching your hair to achieve the vibrant purple colour, this can start to make your hair feel dry. Make sure to use a deep conditioning treatment once a week and ensure you're not bleaching too frequently/only redoing the natural root regrowth. If you'd like any advice on this, do give our Advisory team a call on 0800 328 9214 and an advisor will be happy to help! Response from Schwarzkopf LIVE: Great shade Audra, thanks for leaving us your review! I used Purple Punk to dye my hair and I'm in love with it, I had to buy 2 dyes because I have long hair. I put it over my brunette hair which had faded green and blonde tips (it had blue tips before that's why it faded green). Response from Schwarzkopf LIVE: So pleased to hear it Caitlan, thanks for leaving your review! Wasn't sure about this colour at first, but after a couple washes it faded a little and I love it. 8 weeks and it's still a great colour! Response from Schwarzkopf LIVE: Hi Jane, so glad it's working out for you and we appreciate you taking the time out to review! Response from Schwarzkopf LIVE: Loving the look Sarah, thanks so much for the review! Response from Schwarzkopf LIVE: Hello Senikxy, thank you for taking the time to review. We do state that if you have long thick hair, you will need 2+ boxes. Also apply to damp hair for easier application :) Hope this helps! Response from Schwarzkopf LIVE: Wonderful to hear the lovely feedback, Tammie. Happy colouring! Followed all of the instructions and also dyed it on previously bleached hair and it still turned out pink! Not as dark as it comes out in the tube at all! Response from Schwarzkopf LIVE: Hi Delainey, we're really sorry to hear that, as with most colourants, results can depend on your hair type/colour history, so we'd really like to find out more on this. When possible do call us on 0800 328 9214 for some more advice. Love this colour! I've always purchased my hair dye from Live XXL because these are the only trusted dye's i can find with such beautiful, accurate results. This colour makes you stand out from the crowd and is long lasting, love it! Response from Schwarzkopf LIVE: Loving the purple look, Becky. We're definitely fans of standing out from the crowd as well!